For the first time in my eventing career, I will not be competing at Greater Dayton Horse Trials at Twin Towers on May 17-19. I will be using this weekend at the show to help raise money for Gus’s trip to the Virginia one star and will be giving students the opportunity to attend the show all weekend with me in order to learn the ropes of eventing. Students will walk the stadium and xc courses, watch horses get braided before their dressage test, learn about “bit checks”, warm up ring requirements, after care for the xc horse and much more. If you are interested in eventing at some point in your career or would like to be a groom at a show someday, please sign up in the tack room for a weekend “behind the scenes”. The cost for the weekend is $100 per student. All money raised will go directly to help funding Gus’s show. Students should meet at the barn on Friday at 4:00pm (tentatively). They will ride up with me and the horses to get settled in for the night. Students will be dropped back off at the barn by 9pm Friday evening. Saturday morning they will ride up to Twin Towers with me and watch our riders do their stadium rounds and walk the cross country courses. Sunday we will be watching cross country and learning about the after care for the horse and rider. If interested, please contact Joy or sign up in the tack room. If you are unable to attend, but would like to make a donation, please let me know. Due to the lack of interest we will not be taking students to the Hunter Show on May 11. 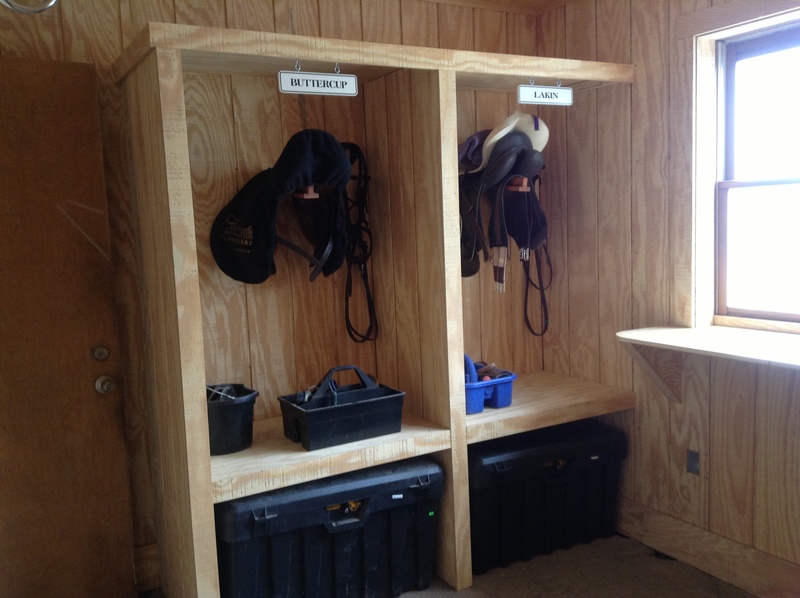 The tack room is finally finished!!!!!! 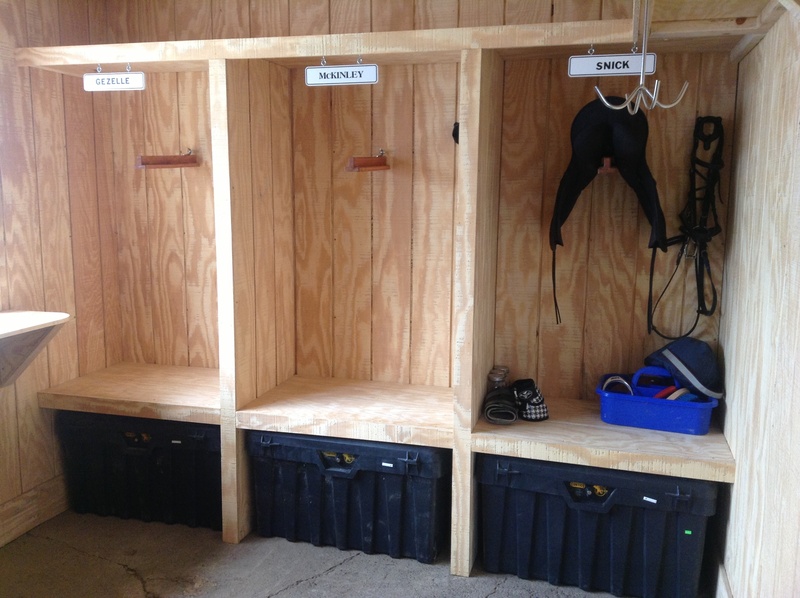 Except for a few outlets and a few more bridle hooks that need to be hung, the tack room in the south barn is finished. 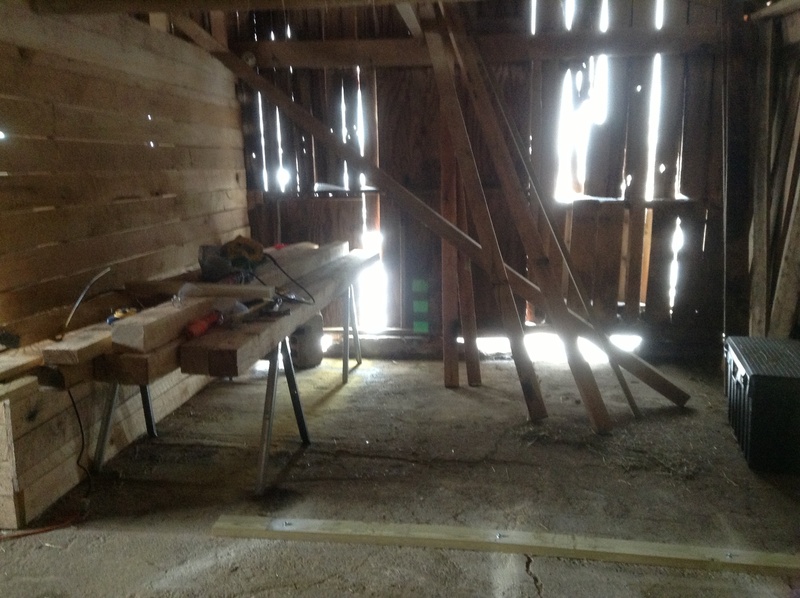 There is still a great deal of work to be done on the barn itself, but the tack room is beautiful! We will put in a new rug and a few barstools later this week. Show Season is upon us!! Hi, everyone! Show season is here. 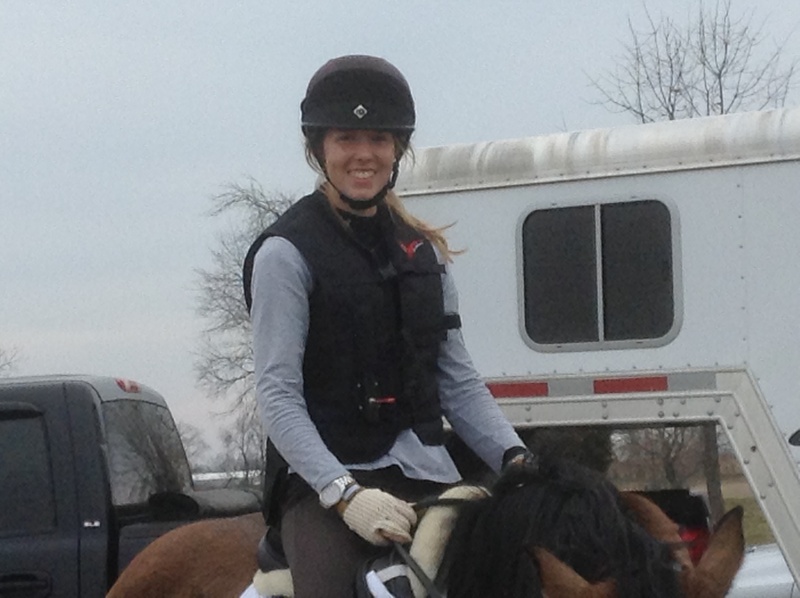 Greater Dayton Horse Trials opening day has come and gone. If you plan to attend Greater Dayton this year, please let me know as soon as possible. All students riding at Novice or higher MUST be members of the — USEA. All horses riding at Novice or higher must also be registered for life through the — USEA. Please make sure all of your paperwork has been filed appropriately before entering the show. I need a copy of everyone’s coggins before they are trailered off of the property. Please bring them to me and leave them on the counter in the tack room. (Ike too :)) That way I will always have a copy in my trailer in case someone forgets their original. We need to plan a mass xc schooling for those of you planning to event this year. Twin Towers will be closing by May 1st, and we need to get up there soon. The show schedule is posted on my website. It is tentative, due to Gus’s schedule. We will try to get to as many mini-trials this year as possible. If anyone has any combined tests or other mini-trials they would like to add, please feel free to email or text me some dates. July is very busy for me with vacation and family commitments, but the rest of the summer looks very good. Show fees are posted on the website. Please feel free to contact me with any questions or comments. 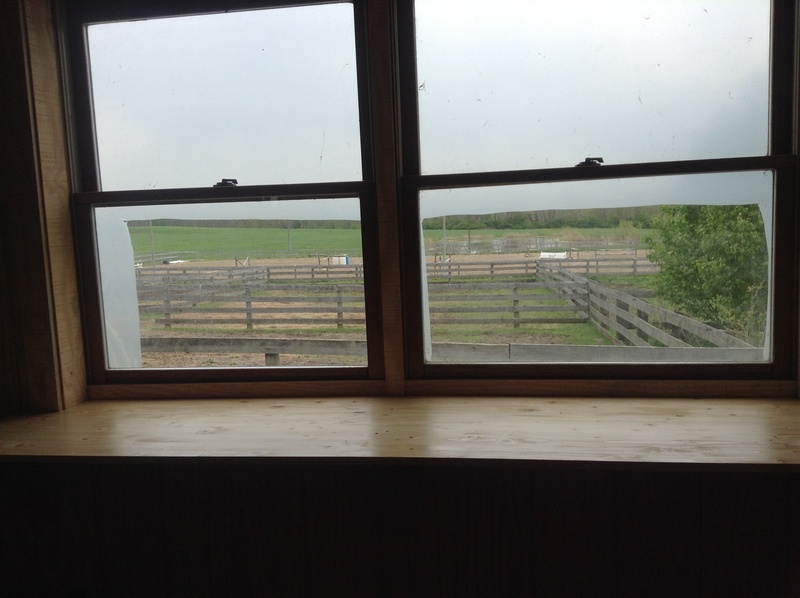 The tack room is STILL under construction. The process has taken about 3 weeks longer than originally estimated. The good news is that the ceiling is in, the wiring is done, the windows are in, the insulation is done on one wall, and the framework is completely done. 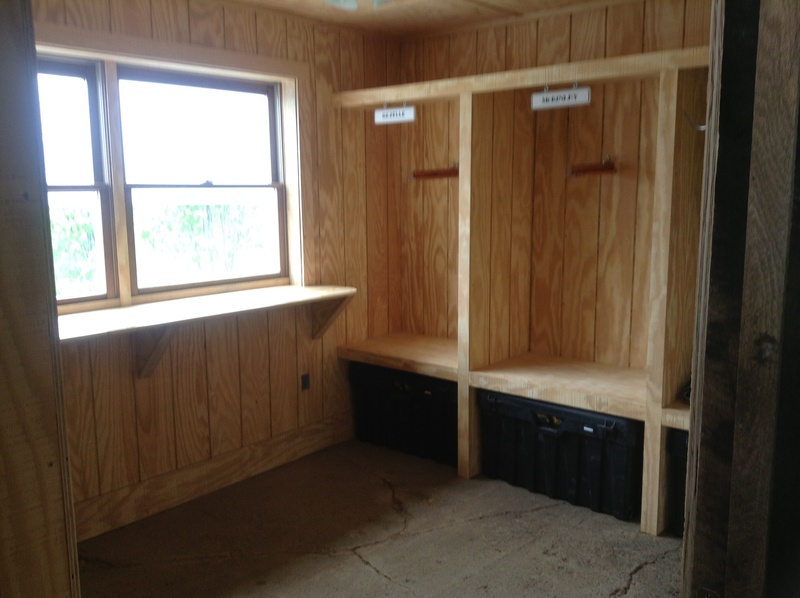 By the end of next week, I am praying that we will have a tack room! It is going to be absolutely beautiful, but WAAAAAYYYY over the original budget. This will be our last major project for the year, and I will be very glad to have it finished. Riding Boot Camp——Last Chance to sign up !! 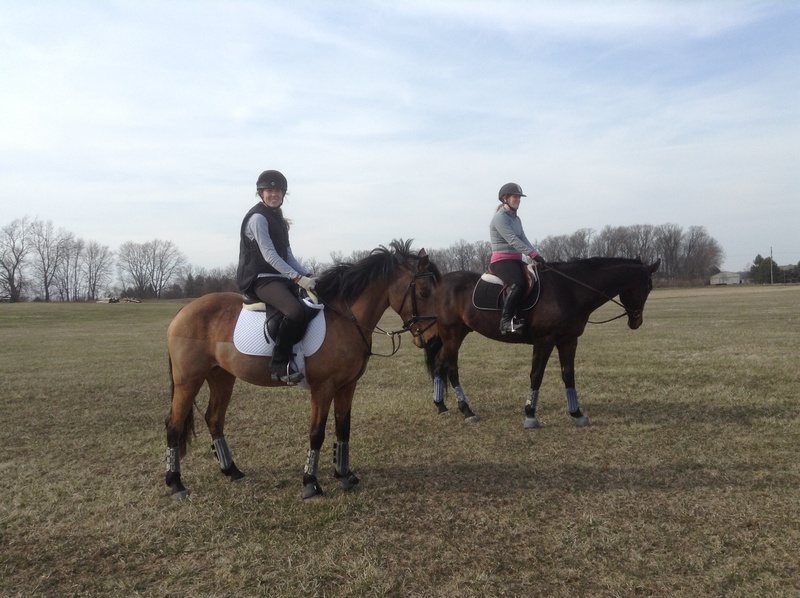 Riding bootcamp will be taking place on Sunday, April 21 from 1pm-4pm. If you would like to ride in the clinic, please sign up on the sheet in the tack room. If you would like to ride, but were unable to make it on the 21st, please sign the sheet below, and I will put you in the next clinic. Depending upon the skills of the horses and riders in the clinic, we may be doing part of the clinic in the jump field. Kelli and I headed to Kentucky on Friday morning with a trailer full of horses. The three traveled well together, and the trip went very smoothly. Murphy was the first one to do his lesson, and he was extremely quiet and well behaved at the trailer, on the lunge line, and in his warm up flat work. I was very pleased with how well he handled the new surroundings. He was excellent for his lesson, jumping nicely around all of the baby starter and starter fences. He has improved greatly on the flat, and his form over fences was even better than it was in Florida. Mia was the next to go. I brought her down to Masterson Friday only because Emerson was slightly off. I had never been on her before, and she had only been ridden twice here since I brought her home three weeks ago. She was very good at the trailer getting tacked up, and was surprisingly independent when we left the 2 boys at the trailer. 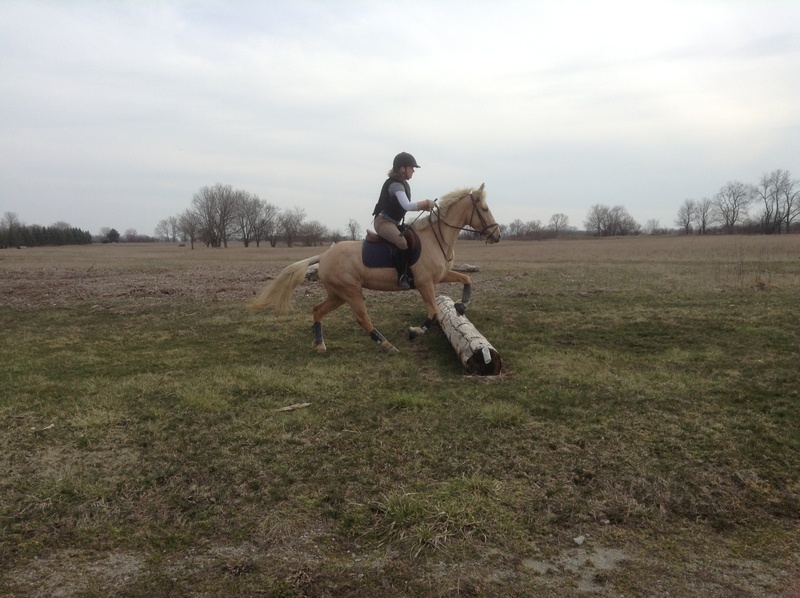 I lunged her briefly, and then did some flatwork with her to make sure I had brakes out in the wide open field. She has lovely gaits, and I thoroughly enjoyed her. We jumped a few cross rails before moving on to the xc fences. She jumped well, and Elissa had me do the same course I had just ridden with Murphy. She was an absolute blast, and I didn’t want to get off of her! Gus was next. It was only the 3rd time I had ridden him since he’s been home from Florida, and the first time I had jumped him in 7 weeks. It felt so nice to be back on my old friend 🙂 We did a stadium lesson out in the field, and ended on a few really nice Intermediate height fences. This Friday I will head back down to Elissa’s for another jump school before Sunday’s xc schooling at Flying Cross. The plan was for Elissa to evaluate two of my 3 young horses to determine which she thinks I should keep as a potential upper level prospect. She feels that at this time, between Mia and Murphy, that Mia is the one that will eventually event at the higher level. 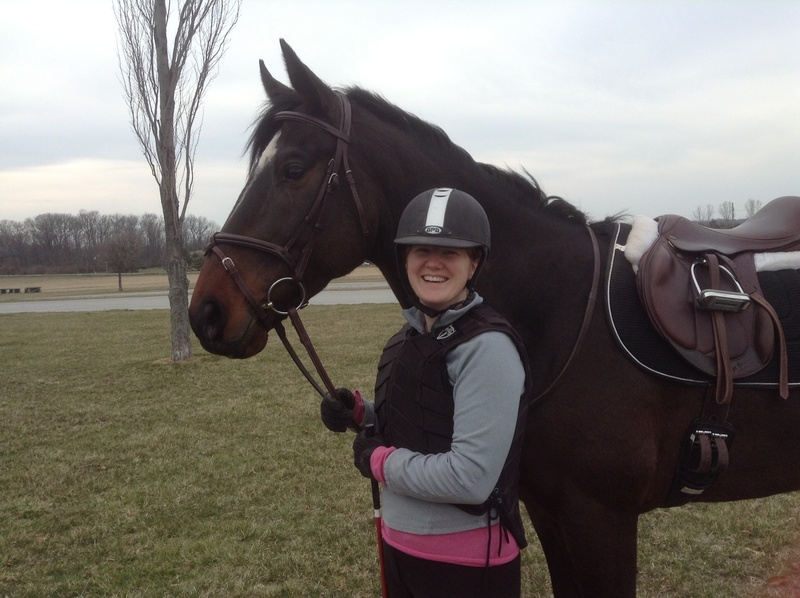 Elissa thinks that Murphy is wonderful, pretty, and trained well enough now to be extremely rideable for most people. Unfortunately, that means that he will be for sale . It makes me very sad to know that I will need to sell him. Time is the main factor in this decision because Gus has only a few years left to compete at the upper levels, and I need to have my next horse doing training level before the end of Gus’s career. So far, Emerson and Mia may be candidates. Time will tell. Tomorrow morning Kelli and I will load up Gus, Murphy, and Mia and head to Masterson Station Park in Lexington for 3 lessons with Elissa. It will be the first time I have ever ridden Mia, one of the new mares I got a few weeks ago. Emerson was supposed to make the trip, but today he looked slightly off in the hind end. He will hang out at home, while the rest of the crew has all of the fun. The goal is to take a lesson on Gus, while Elissa helps me decide which of the other 3 horses to keep and train. She’ll have to see Emerson next time. Murphy has been doing extremely well at home these last few weeks, and I am anxious to get him out on the cross country course again before I enter him in his first show. Mia has supposedly schooled at Masterson before, and I am still on the fence about whether or not to sell her. If she does well, there is a strong chance she’ll do starter in May. Jessica has taken her on as a project while I have tried to keep up with all of the others. She looks like a blast to ride, and I am anxious to get on her tomorrow! A great day for schooling!!! Buttercup and Kelli’s first xc outing together went extremely well. Buttercup did everything even better than we expected. It was her first ever trip off of the farm, and we were thrilled with her! They are looking forward to the next trip. Quinn was her usual energetic self today. She was very well behaved, and was happy to be jumping xc again. A slight swelling in her leg prevented us from doing much today, but we hope to be back at it again soon. Meg thoroughly enjoyed her first ever xc schooling aboard McKinley, who was extremely wound up about being back out doing what he loves best! The pair looks like they are going to be in for a fun year together. It was a successful first trip out to Twin Towers. Everyone is anxiously awaiting the next one! This has been yet another busy week at the farm. Last time I wrote I was getting ready to pick up the two new mares from Kentucky, Mia and Holly. They are both doing really well here. Both horses are for sale, and I believe we may already have found a buyer for Holly! She is to be vetted this week and will stay here at Wetherbrooke Farm with her new owner. Isabelle (aka Fiona FHF) was sold today! Her new owner picked her up this afternoon and took her to her new home just around the corner. Congratulations, Lindsey! 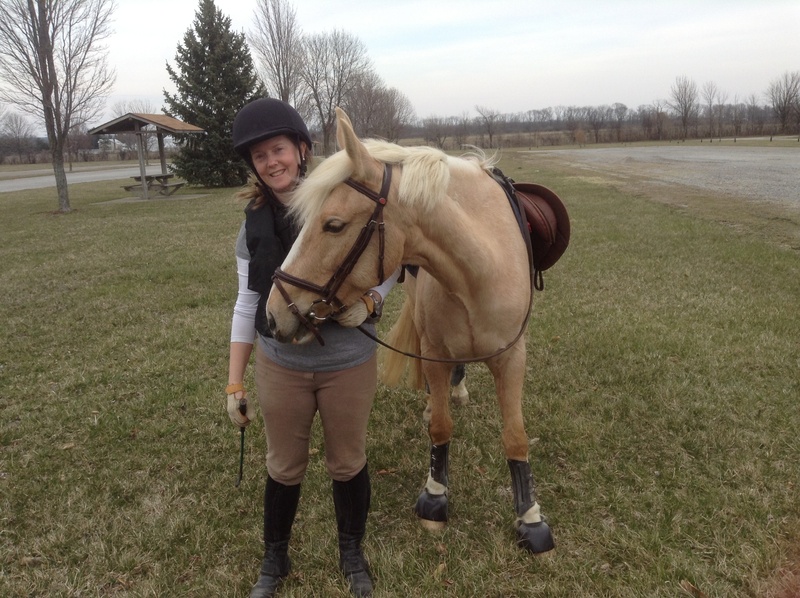 Kelli purchased “Buttercup” last week, and she is looking forward to her first cross country schooling tomorrow at Twin Towers. Congratulations, Kelli! Gus is currently competing at “The Fork” horse trials in Norwood, North Carolina. Elissa is showing him for me after his extra month of training in Florida. So far, Gus and Elissa are tied for 5th after dressage in Open Preliminary out of 27 riders/horses. Tomorrow they do xc, and I’m sure they will be fantastic! Gus is coming home on Monday. I’ll drive down to Kentucky and pick him up after he returns from North Carolina. Murphy was kicked out of Gus’s stall today, and returned to his own stall across the aisle. Back to being #2. Emerson is doing very well in his training. He is jumping crossrails, small verticals, and some small gymnastic lines. His dressage is getting better with each ride, although he definitely has an opinion on things. Gus, Murphy, and Emerson will be headed to Lexington Friday for lessons. It will be my first xc schooling on Gus since our last show in Florida. It will be a real schooling for Murphy and the first time off of the farm for Emerson. The tack room project is taking much longer than expected. Due to a crumbling foundation under the barn wall that needed fixed, we are behind schedule. The tack room is now framed and ready for walls. It is going to be great to finally have it finished! David Stackhouse called this morning to tell me that my new dressage saddle is in the process of being built! It will be able to be picked up at his booth at Rolex at the end of this month! Tonight I entered the horse trials at Poplar for the first weekend in May. We will be heading to Georgia with Elissa and the girls to do one more Prelim before the one star at Virginia. The weather is turning…… and finally there is just a hint of spring in the air.